My viewpoint is born of an urban upbringing in post-Soviet Kyiv, Ukraine. It is strongly informed by politics and activism and sustained by frequent journeys. In these photographs, the overlooked takes center stage. There is a curiousity about the significance of stray objects, textures, geometries, and shadows in our urban environments. Working without artificial light, I record scenes as I see them, rather than staging them. The process here is playful and experimental. It often pairs obscure old optics, film materials, and digital processing. I hope to use photography to bring attention to contrasts and inequalities. Now living in Vancouver, I attempt to explore the city's divides - socio-economic, architectural, etc. My photographic works are held in private collections in Canada, United States, and France and are part of the Getty Images' Creative collection. 2009-2011: Photography for the Mental Health Commission of Canada - documenting Bosman Hotel facility opening, "At Home" project launch, MHCC annual report, etc. 2.2010: Photography for Homelessness in British Columbia scrapbook, a project of the Community Support Worker Program, Selkirk College, Castlegar, BC, Canada. 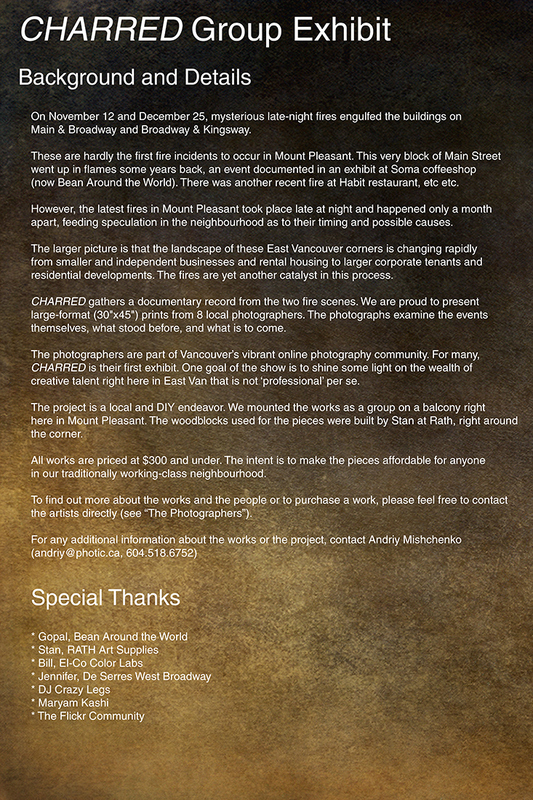 Your inquiries about prints, exhibits, publication and collaborations should be directed to Andriy@Photic.ca.